Zoolino Maxi by HABA lets you build a bear, a bunny, a rhinoceros, and wacky combinations of all three! This 16-piece set is a great introduction to building and stacking for your little one and can be expanded with HABA's Eeny Meeny, Miny, Zoo! or Zoolino for even more creative animal-stacking fun. The pieces are solid beech and perfectly sized for small hands to hold and stack. As with all HABA wooden toys, they are finished with environmentally-friendly and non-toxic finishes which are safe to put in a child's mouth and easy to clean. 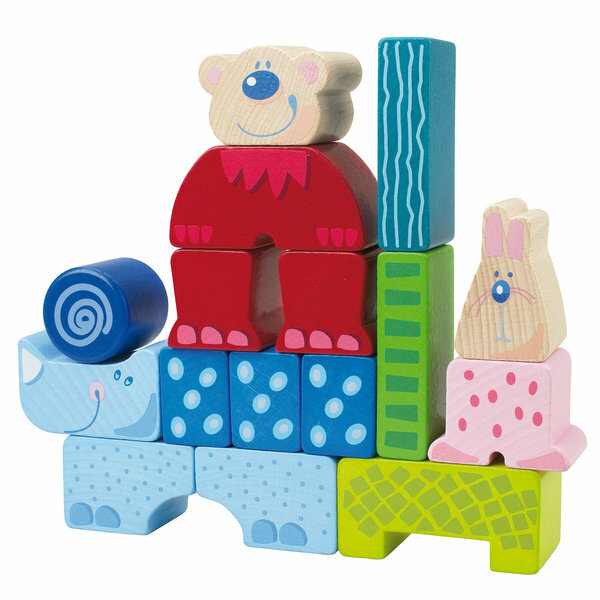 You and your baby will love stacking and building all sorts of animal combinations with this terrific building block set from HABA. For an even bigger menagerie, you can combine it with HABA's Eeny Meeny, Miny, Zoo! and Zoolino sets. • HABA only uses water-based, solvent-free lacquers to finish its wooden toys. All are safe for a child's mouth and are tested for safety by independent certification institutions. Each surface receives multiple layers, producing a silky-smooth surface that is extremely resistant to humidity and wear and tear. HABA is certified for Environmental Standard ISO 14001. This means that the company has adopted a comprehensive plan for minimizing environmental impact in all its processes. Certification requires review and monitoring by an independent auditing institution. HABA Zoolino Maxi meets or exceeds safety specifications set by ASTM International (American Society for Testing and Materials). HABA Zoolino Maxi bears the CE mark meaning that it meets or exceeds safety requirements of the European Safety of Toys Directive. The CE mark is a mandatory requirement for sale of toys in the European Union. HABA has been producing high-quality wooden toys in Germany since 1938. Their first product--a set of colorfully polished building blocks made from locally sourced hardwoods--is still produced today. Since then the company has added a huge range of baby rattles, play kitchen products, games, puzzles, and toys for all ages. Heirloom Quality: Each HABA product is produced with superb craftsmanship and rigorous quality control standards. The result is toys that do not break and colors that will not fade, chip, or crack--even through years of vigorous play! Safety: HABA makes safety a top priority. The company's wooden toys are finished with water-based, solvent-free lacquers that are safe for a child's mouth. Multiple finish layers make the surfaces extremely resistant to wear and tear, and still allow the natural warmth of the wood grain to show through. Social Responsibility: HABA is certified for Environmental Standard ISO 14001. This means that the company has adopted a comprehensive plan for minimizing environmental impact and energy use. The company was also awarded the Job and Family Audit Certificate, recognizing the family-friendly work policies for all its employees.